There is a lot of talk about using evening primrose oil for hair loss when you do a quick Google run. But how does this supplement oil really work when it comes to stopping hair thinning? 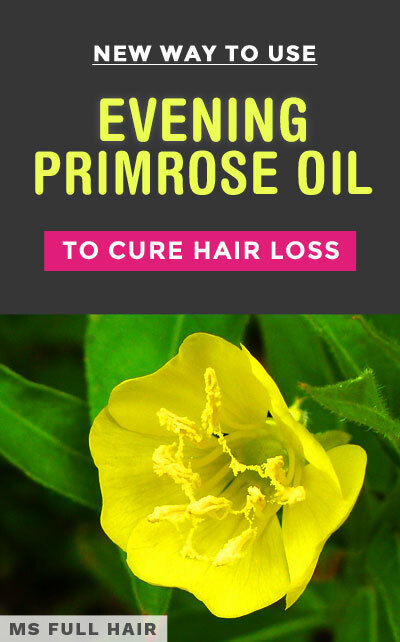 In this review, you will discover a number of research studies and experiments about using evening primrose oil for hair loss and what the results were. 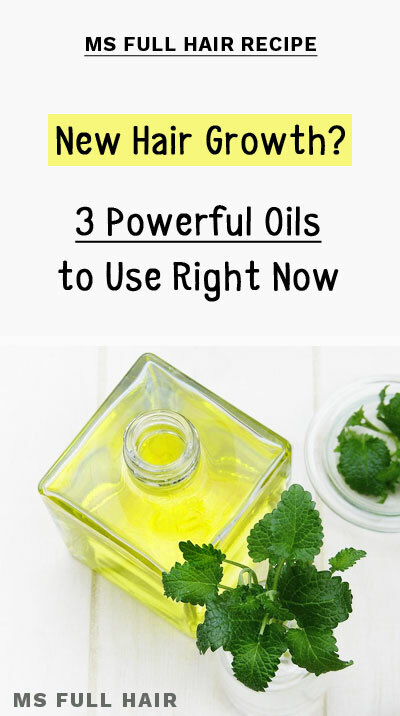 In addition, you will learn 3 different ways to use evening primrose oil for not only stopping hair loss, but for also stimulating new hair growth. Finally, we found a NEW way to incorporate evening primrose oil differently than the conventional route – supplements (Click here to go straight to the NEW way of using it). Evening primrose oil’s official scientific name is oenothera biennis. 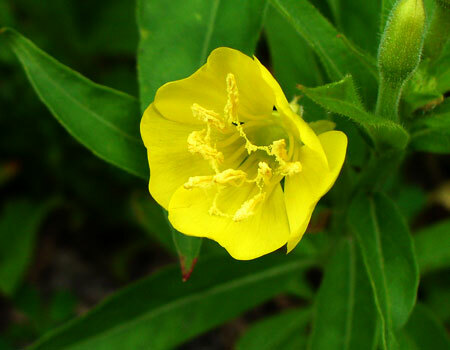 Native to North America and Europe, evening primrose oil is named after its unique behavior. The yellow flowers open up at evening and you can actually see the petals visibly moving while opening themselves up. Evening primrose oil is extracted from the seeds of the evening primrose plants. What makes this oil special is its high content of gamma-linolenic acid (9 to 13%), a part of omega 6 fatty acids. Omega 6 is an “essential” fatty acid and because our bodies can’t produce it on their own, we need to ingest it through dietary consumption. Gamma-linolenic acid (GLA) has multiple (and very positive) benefits when it comes to health. Some of these benefits include regulating high blood pressures and cholesterol levels, preventing diabetes, alleviating psoriasis and eczema symptoms, as well as promoting hair growth. There are numerous studies on GLA and scientists continue exploring its potential new uses related to our health. Evening primrose oil is also very high in linoleic acid (72%), another popular type of omega 6 fatty acid found in many plants and vegetable oils. Quick summary: Evening primrose oil effectively modulates androgen hormones, which in turn stimulates hair growth on the scalp while minimizing unwanted hair growth on face and body areas. Using evening primrose oil for hair loss is a great approach because it helps with DHT hair follicle miniaturization by inhibiting 5a-reductase enzyme activity in the scalp. Evening primrose oil is also effective at regulating imbalanced hormones and helps with thyroid hair loss and PCOS hair loss. Finally, its high linoleic acid content provides an ideal environment for the scalp to prevent inflamed or oily skin. Here are the details along with scientific research studies. According to an European patent application(1) filed in 1989, the researchers share some amazing results on using evening primrose oil for treating male pattern baldness. They note that both androgenic and female hormones have a lot of similarities in their structures. As unsaturated fatty acids effectively modulate the abnormal amount of hormones binding to their receptors in female hormones, they believe that androgenic hormones and their receptors work in a very similar manner. By presenting specific unsaturated fatty acids in a high dosage, it can safely reduce androgen hormones binding to hair follicles. They add that this hormone-and-receptor interaction in result encourage hair growth on the scalp, while inhibiting male-pattern hair growth on body areas (also known as hirsutism). So they designed an experimental study with ingredients that provide these specific unsaturated fatty acids, which include evening primrose oil (for GLA) and fish oil (for EPA and DHA). 1g of evening primrose oil provided 90mg of GLA content which is equivalent to 9% GLA (this brand has 10% of GLA, which is better). Results? In 4 to 8 weeks, the study notes that all of the participants reported “unequivocal” hair growth. Not only was hair growth present on the thinning areas, but they also observed new hair growth on the previously bald areas. The researchers observed the topical application of evening primrose oil in fact gave out BETTER hair growth results. They add that they believe that using evening primrose oil for hair loss topically gave the increased concentration of fatty acids to the follicles directly, thus is more effective on stimulating hair growth. In further tests, different participants (one man and one woman) applied evening primrose oil on a part of their bodies to find out if it actually discourages hair growth on the body other than the scalp. The man participant applied evening primrose oil two times a day to one side of his beard. In 2 weeks, he noticed the beard growth was definitely slower where the oil was applied. The woman participants applied on one of her legs after she shaved her both legs. 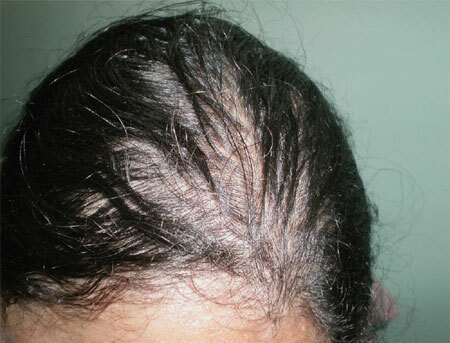 After 6-8 weeks, she observed that hair growth was significantly less where the oil was applied. The results indicate that you don’t have to limit evening primrose oil for taking it as a supplement form. You can also use it for TOPICAL application for encouraging hair growth on thinning areas as well as stopping hair loss (See our recipe #1 below). The researchers also provide the suggested amounts of evening primrose oil for hair loss intakes for stimulating hair growth on the scalp, while reducing unwanted hair growth in the body. Suggestion #2 (topical application): 5% evening primrose oil and 2% concentrated fish oil – Apply topically 1-2 times a day and rub it for 2-3 minutes each time. If you are unsure about applying fish oil on your scalp, see our recipe #1 below. Evening primrose oil contains 9-13% of gamma linolenic acid (Also known as GLA). GLA is a part of omega 6 fatty acid group and known as a healthy fatty acid with various health benefits. A 1992 study (2) shows that certain polyunsaturated fatty acids can effectively inhibit 5a reductase enzyme (the catalyst that converts testosterone to DHT hormones, which is the direct cause of female / male pattern baldness). What are those fatty acids? As you have guessed it, gamma-linolenic acid had the most profound effect (which is high in evening primrose oil and borage oil) followed by alpha linolenic acid (omega 3), palmitoleic acid, and oleic acid (omega 9). A 1997 study (3) also talks about gamma-linolenic acid (high in evening primrose oil) and its effect on inhibiting 5a reductase activities both in vivo and in vitro studies. What researchers found was that when GLA was topically applied to the flank organ of mice treated with testosterone, they noticed the direct link between GLA and 5a-reductase inhibition activity. There are other studies that talk about GLA as a powerful 5a reductase inhibitor, which gives a strong indication for using evening primrose oil for hair loss. When it comes to healthy hair growth, an anti-inflammatory agent plays an essential role by protecting scalp and follicles by preventing unwanted fungal and bacterial growth. As evening primrose oil is high in GLA, when taken orally, it gets converted into prostaglandin 1 (aka PGE1), an essential compound for healthy hair. This molecule acts as an anti-inflammatory agent and protects our skin and scalp. Hair loss due to thyroid – will it grow back? 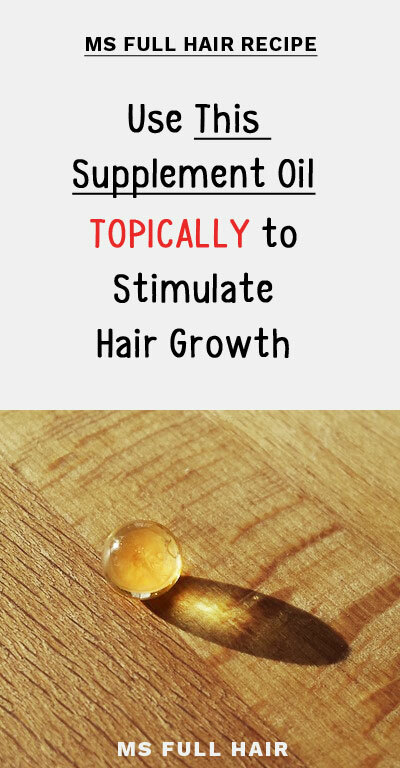 If you are experiencing hair loss due to hypothyroidism or hyperthyroidism, evening primrose oil is probably the best natural route you can take in order to prevent excessive hair fall and possibly promote hair regrowth. The most common symptom under thyroid disorder you will see is diffused hair thinning all over the scalp (whether it’s hypothyroidism or hyperthyroidism). What does thyroid hair loss look like? Here is one of the photos of a woman (4) who is suffering from hypothyroidism. As you can see her hair thinning looks like female hair loss pattern. A 2008 study confirms this fact and indicates that unbalanced levels of thyroid hormones (T3 and T4) can result in structural alterations on hair as well as skin. The result of the study shows that not only does T4 have a direct relationship to extending the anagen (hair growth) phase, but it also helps proliferate hair follicles. The researchers also found both T3 and T4 modulate melanin synthesis (hair pigmentation) as well. This explains that when the thyroid gland is not functioning properly (by being over or under active), you are likely to have mild to excessive hair fall. That’s where many people choose evening primrose oil as a natural treatment. Thyroid hair loss and regrowth: It appears that hair is likely to grow back after your thyroid is regulated and your hormones are back to normal levels. While we haven’t found a specific study dedicated to evening primrose oil for treating thyroid disease, quite a number of women with thyroid disorders report great improvements in the reduction of excessive hair shedding as well as new hair growth on thinning areas, after taking evening primrose oil for hair loss for 4-8 weeks. As evening primrose oil is rich in omega 6 essential fatty acids, it’s believed to contribute to thyroid health by improving its gland functions to produce hormones at an optimal range. Hypothyroidsim is a common symptom among people with polycystic ovarian syndrome (PCOS). Many women with polycystic ovary syndrome also tend to have thyroid issue that is mainly due to hormonal imbalance and insulin resistance in the body. Some of the common symptoms of PCOS include thinning hair, excessive hair fall, hirsutism (unwanted male-pattern hair growth to body parts – except for the scalp), acne, weight gain, and irregular menstraul cycle, just to name a few. It’s believed that PCOS causes excessive levels of testosterone from increased insulin levels, which can result in male-pattern baldness and thinning hair in women – also known as androgenetic alopecia. Evening primrose oil for hair loss can be used as a natural remedy / supplement by balancing estrogen and progesterone levels, thus helping with restoring the normal hair growth cycle. Also the above study (EPO hair growth benefit #1) shows that when you apply EPO topically, it has hair growth stimulant effects on the scalp while suppressing bodily hair growth by regulating androgen hormones. Thus, if you are experiencing PCOS hair loss in addition to hirsutism, both dietary supplements and topical application could be a big help. A 2014 pilot study (6) shows that atopic dermatitis could be treated by evening primrose oil which is high in gamma linolenic acid. Atopic dermatitis, also known as atopic eczema, is an inflamed scalp and skin condition that causes dry and itchiness. When it appears on the scalp, it can lead to seborrheic dermatitis, which then becomes dandruff and can cause hair loss if left alone. The study notes that people with atopic dermatitis (AD) tend to be deficient of delta-6 desaturase, an enzyme that converts linoleic acid to gamma linolenic acid in our body. This means that people with AD has a lower amount of gamma linoleic acid since it lacks the converting enzyme. In order to increase the gamma linoleic acid level (GLA), the study looked at 21 participants with atopic dermatitis and gave them 4 to 6g of evening primrose oil for hair loss to be taken as supplements everyday for 12 weeks. The result? The participants showed the significant increase in GLA levels. The researchers conclude that the study result could be a parameter of using evening primrose oil for atopic dermatitis. There are basically 2 ways of using evening primrose oil for hair loss. The conventional route is taking it supplements and the other is to use it for topical application as carrier oil. Here are the details for each one. Supplement – What’s the best evening primrose oil for hair loss? For high-quality: THIS evening primrose oil supplement contains 10% GLA (130 mg of gamma linolenic acid in each softgel) and comes from a trustworthy and reputable supplement brand. It’s non-GMA and certified with good manufacturing practices (GMP). Plus, the brand also does a 3rd party lab test for its purity and safety. For an affordable price: Another recommendation is Now super primrose supplement. You are already familiar with the brand and its motto for great quality for less price. It’s cold-pressed and each gel capsule has 1300 mg of evening primrose oil and contains 9% GLA (aka 120 mg of gamma linolenic acid in each capsule). The first one has the higher amount of GLA in each softgel. What’s the evening primrose oil dosage for hair loss? How much evening primrose oil should I take for hair growth? First, there is no daily recommended intake established for evening primrose oil hair loss or in general by National Institutes of Health. Note that the most common dosage for hair loss appears to be 1g taken three times a day. When to take evening primrose oil morning or night? Instead of taking once a day, it’s good to spread out throughout a day for continuous absorption in the body. Take one in the morning and the other in the evening after meals. This simple recipe only uses evening primrose oil for hair loss and to be applied on the scalp. It’s based on the study we mentioned in the EPO hair growth benefit #1. The study indicates that applying evening primrose oil topically provides a high concentration of GLA content on specific thinning spots, which in turn stimulates hair regrowth. This recipe uses 3 powerful oils to proliferate hair follicle cells and encouraging hair regrowth. For the best results, continue 5 times a week for at least 1 month. Evening primrose oil is mostly composed of essential omega 6 fatty acids (linoleic acid and gamma linolenic acids), thus it’s considered to be safe. Some minor symptoms include headache, rash and upset stomach. Also note that if you have a bleeding disorder, do not take evening primrose oil as it may increase the bleeding. Takeaway – Should I take evening primrose oil for hair loss? What makes evening primrose oil special is its rich content of gamma linolenic acid (GLA). GLA is a crucial fatty acid that aids in regulating excess androgens from converting testosterone to dihydrotestosterone (DHT) hormones, thus stopping premature hair loss and promoting new hair growth again on the thinning areas of your hair. If you want to go a conventional route, take evening primrose oil supplement for hair loss up to 3000mg (3g) a day. In addition, consider a topical application as well. The above study shows that participants had better results in regrowing hair on balding spots by directly applying evening primrose oil on the scalp. Have you tried evening primrose oil for hair loss? Would love to hear your experience! Is DHT Hair Loss Actually BS? Myth Debunked!